Myanmar Fine Art International, formally known as The Myanmar Gallery of Contemporary Art was opened in 1998 in Yangon and then a permanent gallery in 2001 in Singapore. The gallery showcase the best contemporary artists from the country and promote Burmese art and culture to a worldwide audience. Artist such as U Lun Gywe, Kyee Myint Saw, Tin Maung Oo, Aung Myint, Zaw Win Pe, U Tin Win, Lu Min, Win Pe Myint, Moat Thone, Myat Kyawt, Ba Khine, Tin Tun Hlaing, Nyein Chan Su, Min Zaw has since exhibited in the gallery and galleries worldwide. In 1999 the then, The Myanmar Gallery of Contemporary Art contributed 3 Burmese artists' artworks, being the first for the country, Nyein Chan Su, Min Zaw and Po Po to the 1st Fukuoka Asian Art Triennale in Japan, signalling the acceptance and the beginning appreciation of Burmese art in Asia. 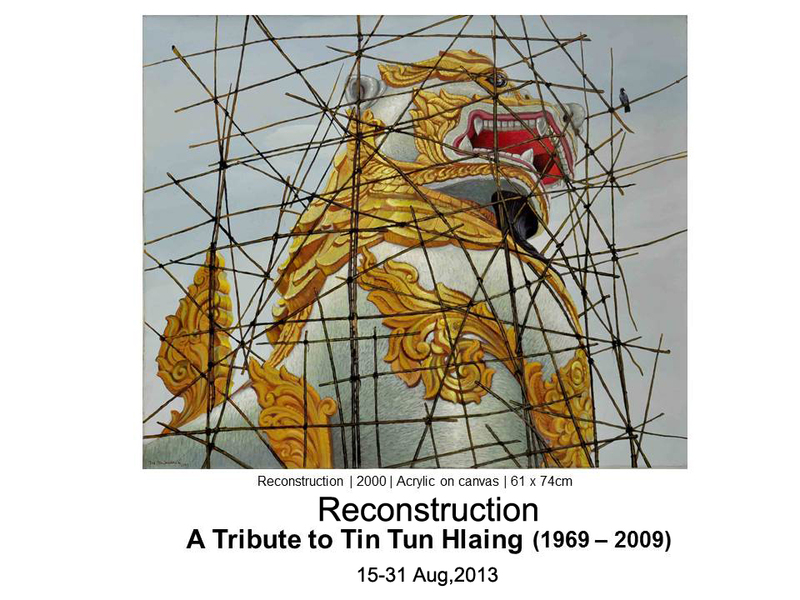 Myanmar Fine Art International with this exhibition "Reconstruction" - A Tribute to Tin Tun Hlaing, will continue what it has started to showcase brilliant Burmese artists in the years to come to the art audience and collectors in Asia and the world.